The sole purpose of this blog is to give a review of books I've read, movies I've seen, places I've been, and food I've eaten For blogs, websites and business establishments as well. Or anything under the sun that needs a review. It can be your shoe or even your boo. Lucy Silchester's life is stuck in a rut and she is currently living a life full of lies while pretending to everyone she's okay. Three years after her breakup with her beloved boyfriend Blake, she pretended and managed to convince herself she was over him. But, apparently her life was stuck. So, Life decided to show up and show her how she is messing their lives. Ever since, reading the previous novels of Ahern, Where Rainbows End and If You Could See Me Now, I got hooked with her writing. I don't even bother read what is the story about. Haha. Just mentally remembering the title of the book whether I bought it already or not. I am like that when I really fancy the author! Anyway, this could be one of my favorites from her yet! Well, the other two got their own charm.... but this one is equally riveting and endearing. The first few chapters were actually annoying. Sorry about that! The... "Okay. I lied." parts of Lucy because it actually confused me for awhile.Actually, the first few chapters were boring.... but, actually it was supposed to be that way because you can see Lucy has been living a very mechanical and meaningless life. This is a very good book for people whose lives are stuck in a rut, for people healing after a breakup in a bad way and did not allow himself/herself to grieve but pretended everything was okay after everything. This actually made me cry (boohoo! ), because I got to reflect about... yeah ... how about if my Life would meet up with me...? Would I be excited? Would I hate him/her? How would I feel? Would I actually love spending time with my Life? It's a really cute concept Ahern placed in this one story... pretty similar to If You Could See Me Now... only with a different "magical/modern" agency. One regular order of their burger can make you burp errr full already! And I had fun with the Liber-tea!! Whooppeeeee!! I take a fancy with teas named after Liberty or any item named "Liberty". Haha. Yum! Sauce!!! Love it! And I tried their strawberry mojito! I like trying out cocktail drinks thats why. woot woot! Not much to review since this is a popular dining place for people in Luzon. Ever since I was a child, I was a fan of his(C.S. Lewis) books, specially the most acclaimed Chronicles of Narnia. It's enchanting and very creative. More reviews each book to come as I re-read them for this blog-review of mine. I saw a trailer of this indie film over TV some 2 weeks ago, and it got me curious. I never wouldve imagined that I would be meeting the Director and 2 actors of the said movie right here in Davao City. I got an invitation for a film showing over at Cinematheque, and since two offices invited me, Tuburan Institute and Happy Team(Councilor Avila of Davao), I grabbed the chance. 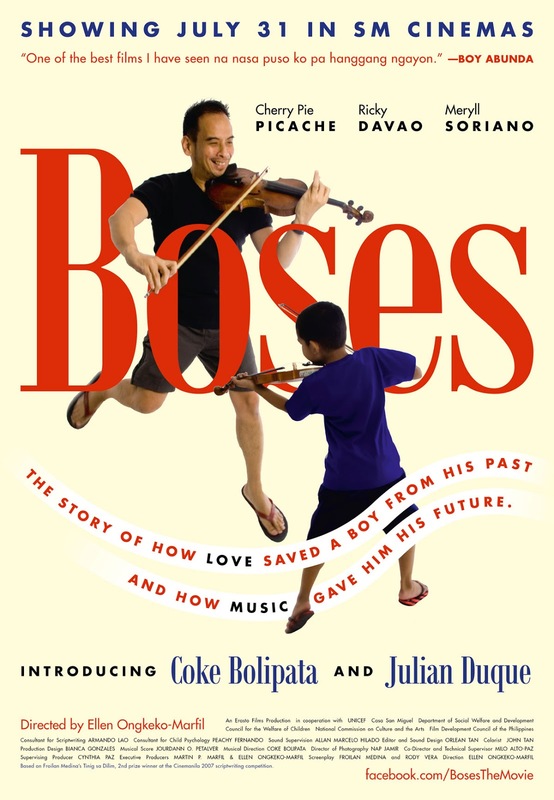 But, I didn't realize the title was "Boses". All I saw at the invite was: "The Heart Speaks", cocktails and live violin by The Cast. And I was pleasantly surprised to realize it was a film showing of Boses. Yahoooo! I finally finished it! It took a month or two of my savings to buy a replacement. Which Ive never done in my whole high school life. Limited budget here for fiction books in the past(mom does not approve of them in the past). And it was just some 3 years ago... that my mom gifted me the whole set! And it was just this year that I started reading them again. Anyway, I had a good time. Specially, whenever Remus gets mentioned in the book. The name has a soft spot on me. Right, my boo? It's riveting and makes you want to read every bit of it. The classes in Hogwarts gets really interesting. (Okay, I sound like Hermione already). Haha... and so do new creatures being introduced in the book. I wanted to visit this coffee shop ever since it opened... however it was only today that I finally got to experience it. It's basically more than three years old already. Woot. I liked the idea because on the outside I could see it has some books. However, it's different when one is in there. I liked the fact that you can probably stay there for quiet some time and not order while waiting for a friend. It's not a "hurried" place, meaning you can stay long to study. It has two ideal area I would have preferred to sit however, the occupants took their time and didn't leave until after an hour or so. My friend told me they have a lot of meals. But, was disappointed to see a few sets and were only served for certain hour. I liked that you can add additional ice cream on top of your frappes though. I liked the nachos 7 layered dip as well. And their nachos too! They have limited pastries, and pica pica's too. But, a lot of tea-choices and drink choices. I don't think it's a place you go to when you are hungry :P But a good place to go to for snacks and to chill out. This is a review blog. Anything that needs a review, It could be a book I've read, a movie I've seen, a restaurant I've tried and even food I've eaten. Or just about anything under the sun that needs a review.